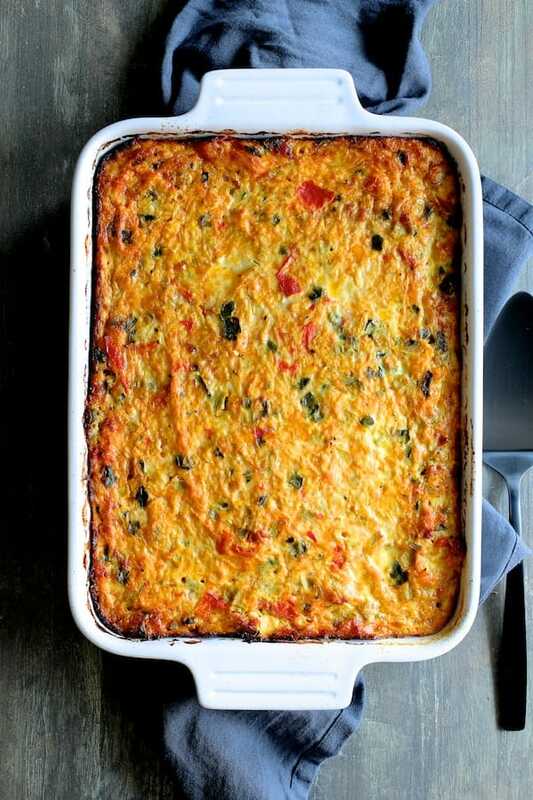 Spaghetti Squash Poblano Chorizo Breakfast Casserole is how you do low-carb for breakfast or brunch with flavor! This Southwestern-inspired dish can be assembled the day before! When baked, individual pieces reheat beautifully! You may have noticed a pattern emerging. Two recipes in a row contain Poblano peppers! Um. Get ready for a third. 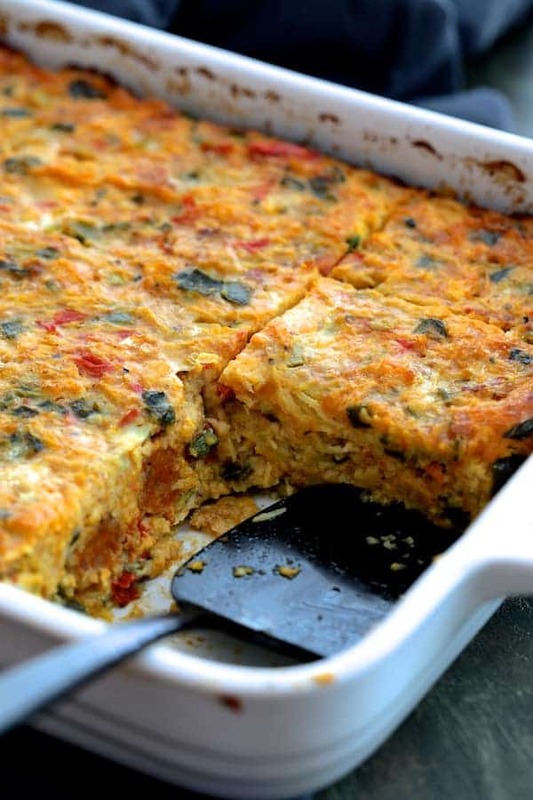 Spaghetti Squash Poblano Chorizo Breakfast Casserole! We were very close to a hard frost here a week or two ago, so my husband picked every last Poblano pepper. We had a bumper crop so I’ve been scrambling to find uses for them. I’ve roasted a TON and look forward to using them in chili this winter. Before heading home, my sister asked if she could give me some spaghetti squash because they had a bumper crop! Taa-daah! This recipe is the successful marriage of two bumper crops! The first thing you need to do is cook the spaghetti squash. You can microwave it, but be sure to punch numerous holes in the squash because otherwise IT WILL EXPLODE in the microwave. Spaghetti squash all over your kitchen will not be a pretty thing! We’re talking the microwave door blowing open and either you or your walls will be wearing spaghetti squash. Don’t go there! Instead, cut it in half and roast it to bring out the flavor and “dry” it out a bit. After shredding the spaghetti squash, the rest is super-easy! Spaghetti squash has a crazy amount of water in it, which is why I didn’t add any milk or other liquid to this casserole. The tomatoes have liquid and the green chiles have liquid. There’s no need to add any more! When finished browning the chorizo and peppers, let them cool slightly then simply combine all the ingredients and bake! That’s it! 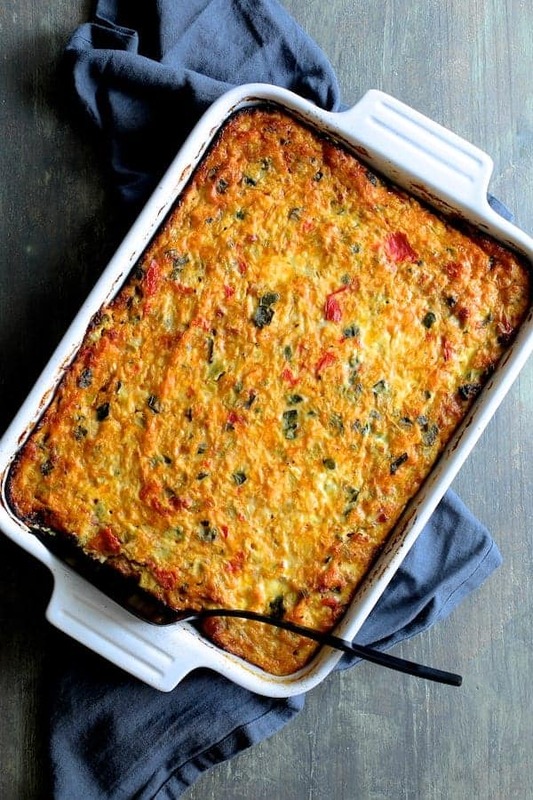 Spaghetti Squash Poblano Chorizo Breakfast Casserole is going to make your low-carb loving friends and family so happy! Be sure to let this Spaghetti Squash Poblano Chorizo Breakfast Casserole rest a bit before cutting into. This dish can be assembled a day or two ahead and when baked, individual pieces reheat beautifully! Line a baking sheet with nonstick aluminum foil. 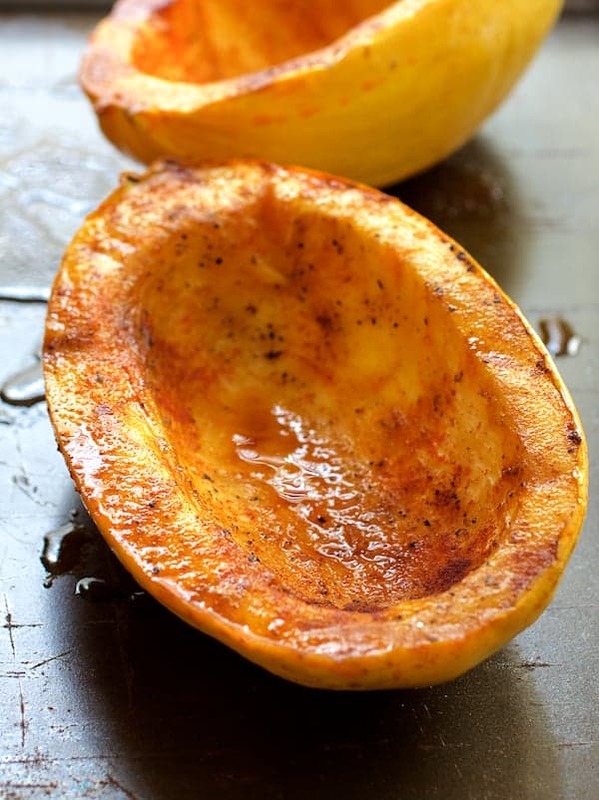 Drizzle the spaghetti squash halves with olive oil and season with salt and black pepper to taste. Turn them over so they are face down on the lined baking sheet. This recipe is a keeper! Can’t wait to make it. Our breakfasts have been just a touch boring. This would jazz it up! Have a great Sunday!! Thanks, Marisa! I love incorporating veggies into breakfast!